The Imagicle ApplicationSuite for Microsoft Skype for Business offers an all in one suite of must-have applications empowering the Unified Communications for enterprises and small-medium businesses. It addresses the needs of organizations from any vertical, providing the most complete set of UC applications, thus granting an awesome, easy experience to all users, from their IP phones, browsers, and mobile devices. You can purchase the full suite bundle or a single product and always try the other ones for free for 30 days. Start using them in production whenever you need. As easy as activating a license. One Suite grants you great savings with a single installation-deployment, but you'll love also how affordable it is for your company, either you need to serve 25 users or 25.000. You can count on our technical support and software maintenance program that will assist you in any situation. Imagicle Care services are included in every purchase and you'll love them. 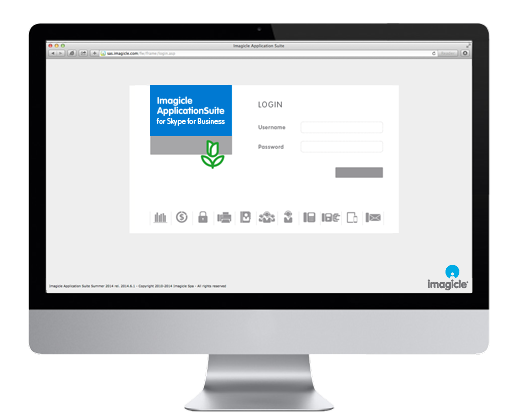 The Imagicle AppSuite can be deployed on-prem, hosted or in the cloud. It supports any virtualization enviroment and the Imagicle Virtual Appliance is also available for a 60' deployment. Each user can choose her/his preferred one among English, Spanish, German, French, Arabic and Italian, while operators can use the Attendant Console also in Portuguese and Dutch. The Imagicle ApplicationSuite provides application reliability thanks to the redundancy modules, where a secondary server guarantees the critical services, also over WAN for Disaster Recovery. Best in class, beautiful and easy apps. One Suite means saving time and hard dollars, as operations can be reduced at their minimum: i.e. users can automatically synchronize with Microsoft Active Directory and are shared among all the apps. Manual or automatic from Microsoft AD and CSV files. Imagicle Attendant Console has been tested to be Windows 10 Compatible. Imagicle ApplicationSuite is Windows Server 2012/2016 certified. Some of the best support I've never experienced!